When it comes to decorating our homes, the bedroom (sadly) often becomes a low priority. Maybe it's because we spend most of our time in there with our eyes shut, or because it's the room least likely to be seen by guests. Whatever the reason, too many bedrooms tend to feel like blank slates. That was precisely the case for Erica Chan Coffman of the blog HonestlyWTF. 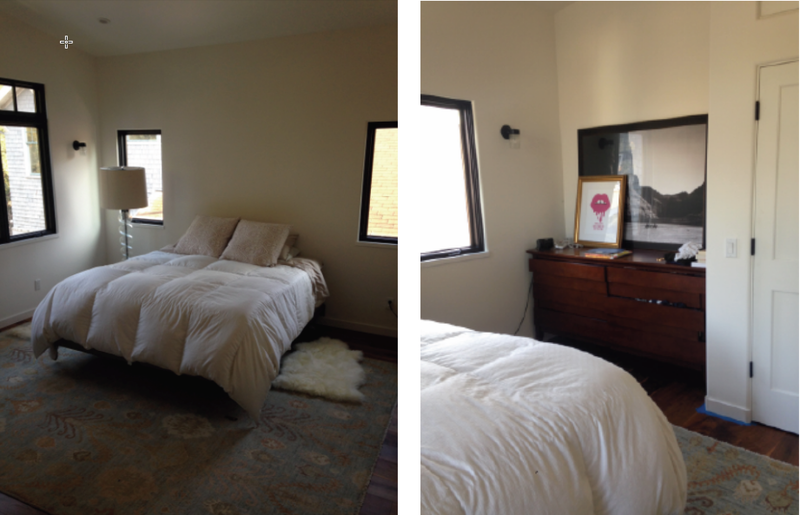 While the "before" (see below) shows a few promising elements (like the flokati rugs), the room didn't reflect her fabulous taste. That's why she turned to celebrity designer Will Wick, who collaborated with the online design service Decorist, to help bring out the personality in this space. The new look feels cozy yet spacious, thanks to the neutral palette of white, beige, and gray hues. This serves to create a gallery-like effect that allows carefully curated accessories to truly shine. "It's such a perfect reflection of Erica's style, combining modern, vintage and global elements — from the pineapple lamp she scouted on Chairish, to the textured St. Frank Juju Hat from Cameroon, to the sleek lacquered nailhead dresser," Wick says.